Bugle Hole is one of my favourite places to swim (though it has to be admitted there are many). Just along the coast path from Mothecombe, it is a keyhole-shaped inlet that fills up at high water to make a perfect natural swimming pool. Today I visited at low water - when it becomes a location worthy of the adventures of the Famous Five, complete with caves, smugglers passages and treasure. I climbed down perilously slippery rocks, while my two boys sat in the sun and read books and played on their devices. Once down in the 'hole' I did a bit of cowrie-hunting, and found three of the little pearl-like shells, before getting changed into my swimmers and heading off to explore what I call the Pink Passage. It's a secret tunnel from the inlet through to the sea outside, and I imagine could well have been used by smugglers. Walking through I was hit by a succession of sensations of colour and sound, the pink, green, purple and white of the rocks, and the water constantly gurgling, groaning and booming. Once through I swam through a dark green channel of water and out into a more open area of sea before swimming back into the Hole through another passageway through the rocks. Watch "Pink Passage: the Movie" below! 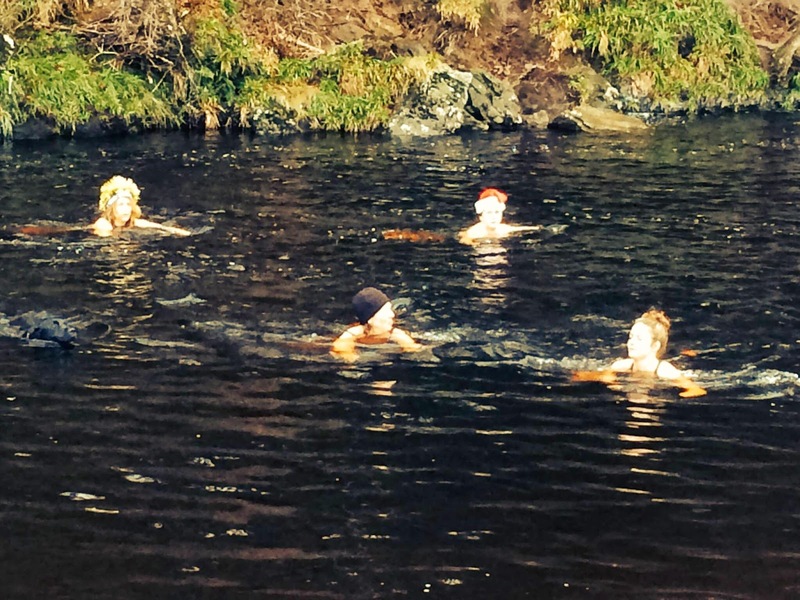 Swimming in devilishly cold water is the perfect antidote to all the slobbing, sitting and scoffing that goes on at this time of year. 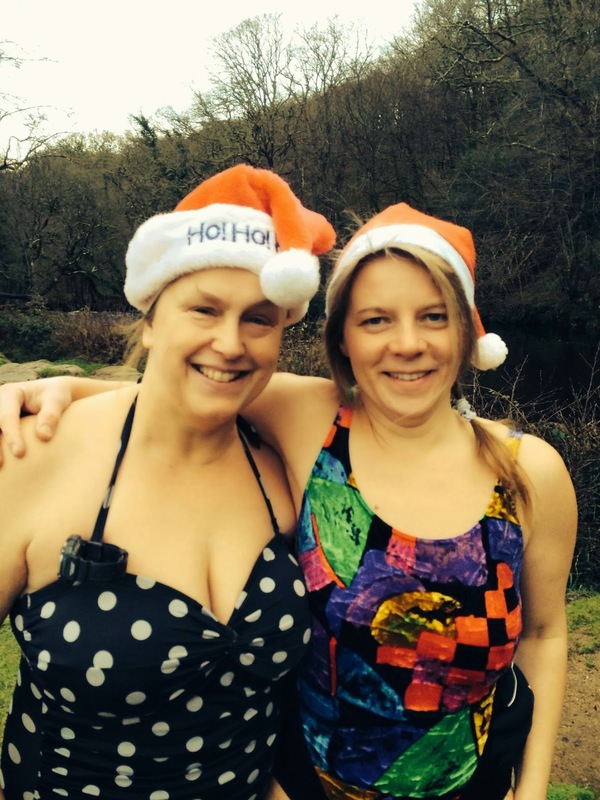 On Christmas morning we met early on the banks of the Dart for a bracing plunge, adorned in Santa hats and tinsel, before heading back to our various families and festive traditions. 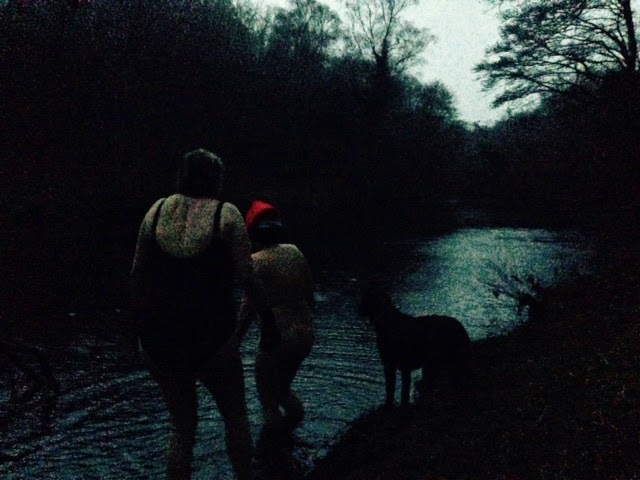 Then on Boxing Day, Anna, Yaara and I had a dimpsy dip in the pouring rain. Today, there was frost on the ground and ice in the puddles as we met again at Spitchwick. As I stood in the water preparing to immerse it felt as though a thousand tiny daggers were plunging into my legs. The water was a perishing 5.1 degrees by my watch - but 3.8 by Judy's. "Why do you do it?" I hear you ask. Well it's a bit of a cliche, but like most cliches it's true:there is something so invigorating and revitalising about the cold water....it restores you to your factory settings. 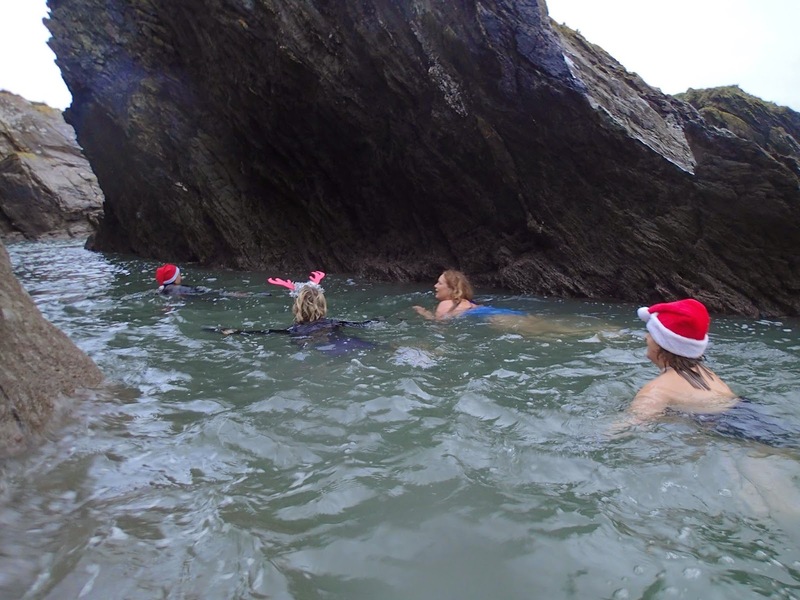 We have an emerging tradition which involves a carol singing party on the Saturday before Christmas - known as "Carols and Carousing" followed by a swim at Sugary Cove in Dartmouth the following day. Also part of the tradition is Queenie and Kate missing the party, but managing to get to the swim. Last year they got the wrong day, this year, Kate felt lousy; we're already speculating what next year's excuse will be. Still, they made it to Sugary Cove, where it was generally agreed that this was the perfect way to cure the hangovers and celebrate the shortest day of the year - or rather, the start of days getting longer. In fact it turned out to be a day of double dipping, as Rachel and I also went in the Dart earlier, where it was a chilly 8 degrees. The swim was enlivened by a naturist who joined in, and did some bracing stretches on the bank into the bargain. At Sugary Cove the sea was three and a half degrees warmer, and we had a glorious swim through the channel to Castle Cove, before scoffing Queenie's delicious home-made mince pies, still warm, on the beach afterwards. I've just returned from a magical weekend with our friends the Scottish Swimming Lassies and Lads, in which we sailed the seas and swam with starfish. Anna, Yaara and I flew to Glasgow and then drove up past Loch Lomond, Loch Fyne, and finally Loch Sween, before finally arriving at Carsaig Bay, on the Sound of Jura. It was dark when we got there but we couldn't resist a night-time dip off the jetty in front of Charlotte and Duggie's house, before settling down to a hearty dinner and chats in front of the wood-burning stove. The following morning it was so exciting to wake up and see the mountains of Jura across the sea. 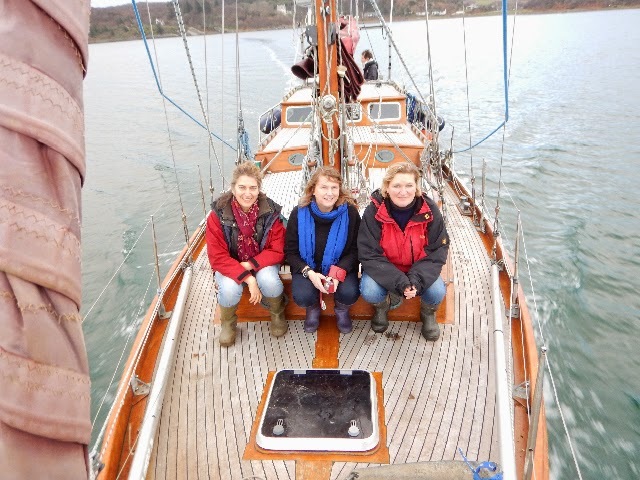 Iona arrived and we went down to the jetty where we got into Sea Pie, a little dinghy, to row out to Wild Rose, Duggie's absolutely beautiful yacht. He built her himself over five summers and we felt so privileged to be allowed on board. We couldn't wait to explore, and were particularly delighted to find a cosy fire burning in the cabin below. Frequent cries of "this is the life" were heard (and in fact were heard throughout the entire weekend) as we sailed out of the Bay, and headed south past an island and down towards a very craggy part of the coast that Charlotte and Duggie call "Raven's Nest". We leapt off the boat (or rather, inelegantly lowered ourselves down the ladder) and into the beautiful dark green water for a delicious swim amongst the kelp gardens, with lots of wrasse darting about below us. Duggie was an absolute gentleman and after his swim came back with Sea Pie to collect us, so we didn't have to haul ourselves up the ladder back on board. The next adventure was the hot tub on the shore - another of Duggie's brilliant creations. 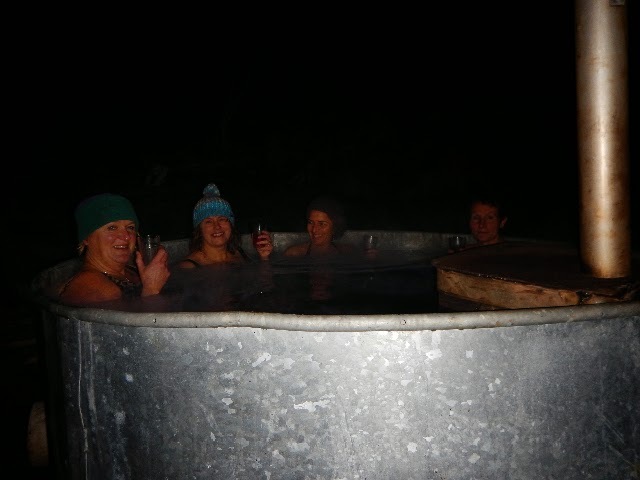 As dusk fell we decadently wallowed in the tub while drinking wine and nibbling cashews, occasionally punctuating the indulgence with a shock-inducing sea-dip. Sunday dawned sunny, and so followed another unforgettable day. We met Iona again, and also Martin and Fraser, at Danna, at the mouth of Loch Sween, where the water was unbelievably clear and we saw starfish. In the afternoon we again went out in Wild Rose, sailing north this time into the Sound, where we spotted George Orwell's house on Jura, and all had a go at the helm. On the way back we had a swim in a channel near Carsaig Island, where we spotted two seals. They came into the water but did not approach us, which for me was an enormous relief as I find the Devon seals way too friendly. As we started back towards home a most vivid sunset started to take place over the Paps of Jura. 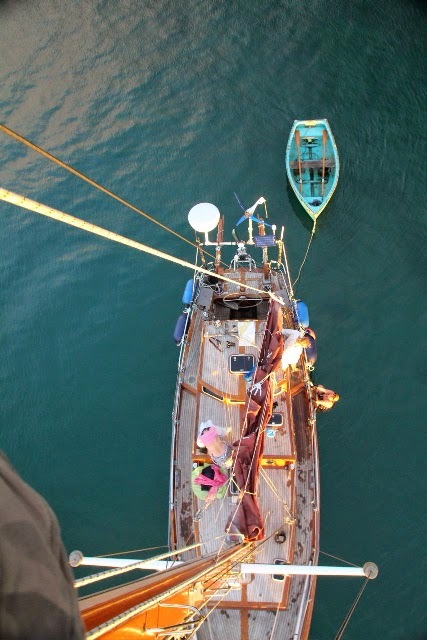 We put down the anchor and watched the sun set and the moon rise, and Duggie and Yaara had a swim in the twilight.